Providing fun activities for children in school can make learning fast and easy. Learning about the continents and identifying them may be a bit confusing to children. You have to think of ways to make learning seem like playtime for them. Making a globe with cut-out continents can be an interactive way for children to learn about the world. They get to make their own globes, place the cut-out continents to their proper places and identify the continent in which they are. Prepare a mixture of 1 cup flour to 2 cups water and salt to make your glue. Adding the salt will prevent mold from growing in your mixture. If the area you live in is humid, less water is required. Stir until you reach the desired thickness of your glue. Fully inflate the balloon and tie it. Cut strips of newspapers in various sizes. Dip the cut-out newspapers in the glue and stick them to the balloon. Cover the entire balloon with newspapers until it's solid enough to form your globe. Do two to three layers at a time. Allow each layer to dry completely before adding more layers to prevent sagging. This process may take days to finish. Coat the paper mache with colorless acrylic paint once it's totally dry. Using an acrylic paint will make it easier for you and the children to paint the paper mache. Let the acrylic paint dry. Pop the balloon using a sharp object. Paint your paper mache globe with a blue watercolor or acrylic paint, which will represent the different bodies of water of the globe. Draw a horizontal line around the middle part of the globe using a black marker. This will be the equator. Print out free templates of the seven continents from a website like PBS Kids, for example. Cut out each continent. You may also ask the children to color the continents before they cut them out to make the globe more colorful. Paste the continents to their respective locations. 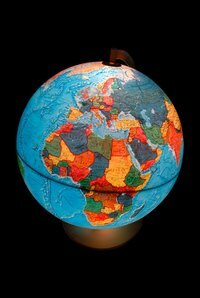 Use a map or atlas as your guide when instructing children where to place the continents. You can even ask children to locate the continent they are in once they are done.